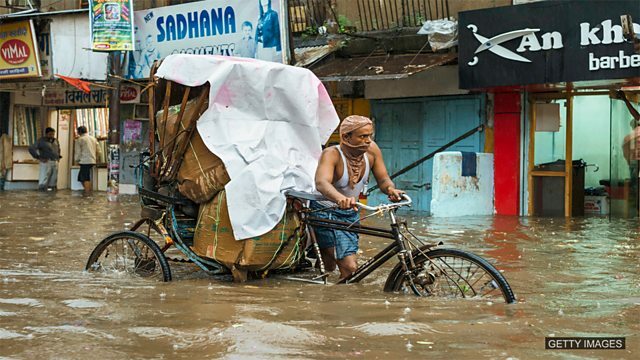 How many people around the world have been affected by floods in the last twenty years? Hi everybody, I’m Tom and it’s pretty wet here in the UK at the moment, isn’t it, Sian? It certainly is! Hello everybody! Today we’re going to be talking about floods and flooding. A flood ને ગુજરાતીમાં કહીશું પૂર. બીજો અર્થ થાય છે જળપ્રલય. ‘Flooding’ એટલે વરસાદના કારણે સમ્રગ વિસ્તારમાં પાણી ભરાઈ જવું. મિત્રો, આજનો પ્રશ્ન પણ પૂર સાથે સંલગ્ન છે. યુ.કે. ના ચેનલ 4 ન્યૂઝ મુજબ છેલ્લા 20 વર્ષોમાં સમગ્ર વિશ્વમાં કેટલા લોકો પૂરથી પ્રભાવિત થયા છે? અમે તમને જવાબ થોડીવારમાં જણાવીશું. હવે તમે BBC Radio 4 નાં Costing the Earth કાર્યક્રમ માટે તૈયાર દ્વારા કરવામાં આવેલ સમાચાર સાંભળો. યુ.કે. માં હાલમાં જે પૂર આવ્યું તેના કારણો વિશે ન્યૂઝમાં વાત કરવામાં આવી છે. Mark Gimmett is just one of the thousands of people who watched as their homes and belongings were ruined this summer by the worst floods in sixty years. The weather was, of course, the main cause, but 75% of our land is farmland and today Costing the Earth is asking if intensive farming is contributing to the problem and if farmers should be asked to change the way the farm to help avoid more floods. So, the presenter mentioned how, mainly, the weather was responsible for floods but she also suggested that farming might have something to do with it, too. I’m not sure, to be honest. People seem to blame farming for lots of things at the moment. It’s not the farmers’ fault that rivers are swollen, is it? ‘Swollen’ ને ગુજરાતીમાં કહીશું સામાન્ય કરતાં મોટી. પહેલાં નદી પાણીના વધતા પ્રવાહના કારણે વધે છે, જેને અંગ્રેજીમાં ‘swells’ કહેવામાં આવે છે. આ એક ક્રિયાપદ છે. જ્યારે નદીમાં પાણી વધી જાય તો અંગ્રેજીમાં કહીશું ‘swollen’, જે એક વિશેષણ છે. મિત્રો, જ્યારે ઈજાના કારણે સોજો આવી જાય તો અંગ્રેજીમાં ‘swollen’ કહેવામાં આવે છે. We can also use ‘swell’ and ‘swollen’ for injuries, right? Correct, it’s not a very positive adjective, generally. Why do you think she blames farming, anyway? She spoke about the quality of land used in farming. There’s an idea that as soil becomes eroded, it becomes less able to hold water. ‘Eroded’ એટલે ધોવાણ થવું. And, as ‘soil erosion’ occurs, it can loosen the land, too. ‘Soil erosion’ ને ગુજરાતીમાં કહીશું જમીનનું ધોવાણ. Exactly! So with more water and less stable land, is it any surprise that rivers burst their banks? Good point! નદીના પટને અંગ્રેજીમાં ‘river bank’ કહેવામાં આવે છે. ‘To burst’ ને ગુજરાતીમાં કહીશું જોરથી એકાએક ફાટવું કે ફૂટવું. મિત્રો, જ્યારે ‘burst its banks’ કહેવામાં આવે ત્યારે એનો અર્થ થયો કે નદી ઊભરાઈ ગઈ છે. It can be very dangerous when river banks burst. Do you have any protection from flooding in the UK? Well, in London we do have a flood barrier to make sure we aren't swept away but it’s getting very old. Ah! ‘To sweep away’ means to remove completely. ‘A flood barrier’ એ એક ચોક્કસ પ્રકારનો ફ્લૅગેટ છે, જે પાછળના રક્ષિત વિસ્તારને પૂર અને દરિયાઈ ભરતીથી બચાવે છે. ભારતમાં ‘flood barrier’ ઘણી જગ્યાએ હજુ પણ અસ્તિત્વમાં નથી. Anyway, talking of flooding around the world, can you give us the answer to today’s quiz? Certainly! Channel 4 News મુજબ જવાબ છે (ક). છેલ્લા બે દાયકામાં 2.3 અબજ લોકો પૂરથી પ્રભાવિત થયા છે. That’s more or less a quarter of the world’s population! Maybe flood barriers aren’t working well enough and we need some other preventative measures? ‘Preventative measures’ એટલે પ્રતિબંધક પગલાં. I know what measures I’m going to take to prevent my stuff getting damaged in floods. I’m going to buy a flat at the top of a very tall building. Perfect! Never mind, you’ll have to find a new plan, Sian. શોન, આશા રાખીએ કે બીજી વખત તમે વધુ નસીબદાર નિકળો! મિત્રો, આજે જે કંઈ પણ શીખ્યા એનું પુનરાવર્તન કરી લઈએ. ‘Floods’ એટલે કે પૂરનાં કારણે નદીઓ ઉપર થતી અસરો વિશે વાત કરી અને જાણ્યું કે પૂરનાં નદીઓને ‘swollen’ કરી નાંખે છે. ‘Swollen’ ને ગુજરાતીમાં કહીશું સામાન્ય કરતાં મોટી. પૂરના કારણે જમીનનું ધોવાણ એટલે કે ‘soil erosion’ થાય છે જેનાથી ‘river banks’ એ ‘burst’ થઈ જાય છે. ગુજરાતીમાં ‘burst’ ને કહીશું જોરથી એકાએક ફાટવું કે ફૂટવું. આવી સ્થિતિમાં વસ્તુઓ ‘swept away’ એટલે કે વહી જાય છે. મિત્રો, તમારા મતે શું ‘flood barriers’ જેવા પ્રતિબંધક પગલાં લેવાથી પરિસ્થિતિમાં કોઈ ફરક પડશે કે પછી સમય થઈ ગયો છે કંઈક નવો વિચારવાનો? ‘Flood barriers’ ને ગુજરાતીમાં એક ચોક્કસ પ્રકારનો ફ્લૅગેટ, જે પાછળના રક્ષિત વિસ્તારને પૂર અને દરિયાઈ ભરતીથી બચાવે છે. Thanks for joining us and see you next time for more English Together! Bye! To sweep away means to remove something quickly and completely. Floods often sweep away land, property and other things. Often, when talking about floods, we want to emphasise the things the flood has damaged. We then use the passive, [to be] swept away. Be careful when you go swimming! The sea can sweep you away, even if you are a strong swimmer! Houses and bridges were swept away in the recent floods. If something is swollen it is enlarged (larger than normal). The verb is to swell. We often use swollen as a negative adjective to describe something being larger than it should be. It is often used in the context of injuries. My thumb was swollen for a week after I fell off my bike! Football injuries are a common cause of swollen ankles. Erosion is the process of slow or gradual destruction. Often, water can be a main cause of erosion. The verb is to erode and the adjective is eroded. People in the towns are concerned that the old bridge has suffered from erosion and is no longer safe. The castle walls were once very strong, but over time they have been eroded by the weather.